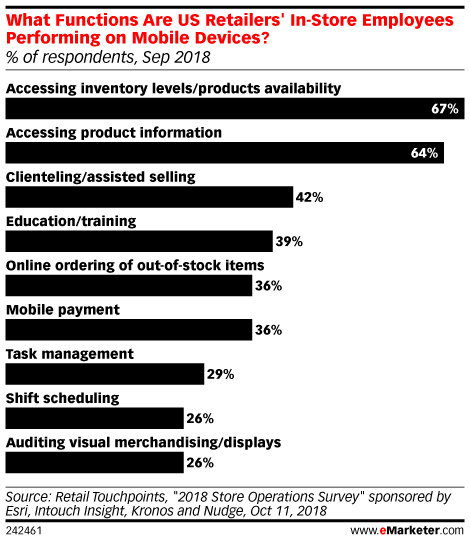 Data is from the October 2018 Retail Touchpoints "2018 Store Operations Survey" sponsored by Esri, Intouch Insight, Kronos and Nudge. 115 retail professionals were surveyed during August-September 2018. The majority of the retailers were US-based. The retailers were executives from retail companies with brick-and-mortar stores. The industries represented include: big-box stores (17%), convenience stores (3%), department stores (14%), drugstores/pharmacies (4%), office supplies (2%), specialty hard goods (18%), specialty soft goods (12%), supermarkets/grocery (11%) and other (19%).